Bruce v. State, 318 Md. 706, 569 A.2d 1254 (1990) (on cross-examination the defendant is entitled to examine "(1) a written statement made by said witness and signed or otherwise adopted or approved by him; (2) a stenographic, mechanical, electrical, or other recording, or a transcription thereof, which is a substantially verbatim recital of an oral statement made by said witness and recorded contemporaneously with the making of such oral statement.") Bruce, 318 Md. at 724, 569 A.2d at 1263. Technician properly trained. Ct. & Jud. Proc. Art., § 10-304 (3). "Qualified person" means a person who has received training in the use of the equipment in a training program approved by the toxicologist under the Postmortem Examiners Commission and who is either a police officer, a police employee, an employee of the office of the Chief Medical Examiner, or a person authorized by the toxicologist under the Postmortem Examiners Commission. Cts. & Jud. Proc. Art., § 10-304 (b). The test of breath shall be administered by a qualified person with equipment approved by the toxicologist under the Postmortem Examiners Commission at the direction of a police officer. . .
Not arresting officer. Ct. & Jud. Proc. Art., § 10-304 (b) . . . The officer arresting the individual may not administer the test of breath. Technician must be present if demand for test technician filed by defendant. Ct. & Jud. Proc. Art., 10-306. Regulatory - Regulations of the Toxicologist, Post Mortem Examiners Commission, State of Maryland, Regarding Tests of Breath and Blood for Alcohol, effective September 30, 2001. Initial certification. § G.1. Each operator must have at least a score of 90% on a written exam after a course comprised of a minimum of 35 hours of lecture and laboratory instruction. This instruction includes training in "mathematics of the metric system," study "of the properties, human physiology and pharmacology of alcohol," study of "the theory, operating principles, and maintenance requirements of the Breath Test Instruments," review of relevant statutes, regulations and cases, and testing on human subjects. Recertification. § G.2. A 6 hour review course is given and passing is lowered to 80%. § I.1. Alcohol Testing Program Log - Each agency is required to keep a permanent log at each location where a Breath Test Instrument is housed. § I.3. Alcohol Influence Summary Report -Each agency's Breath Test Supervisor shall complete an Alcohol Influence Summary Report on a monthly basis. § I.4. Breath Test Instrument Field Inspection Report Form - A Breath Test Instrument Field Inspection Report Form recording the results of Maintenance Tests shall be completed. 20 minute observation period. Cts. & Jud. Proc. Art. § 10-304(b) precludes the arresting officer from "administering" the test. At the same time, the method to "conduct" the test, specified in the Toxicologist's Regulation includes the 20 minute observation period. See also, State v. Carson, 988 P.2d 225 (Id.App. 1999)(watching def through rearview mirror is not observation); State v. Baker, 355 P.2d 806 (Wash. 1960)(observation was for fourteen minutes, test suppressed); State v. Martin, 2003 WL 57311 (Tenn.Crim.App. 2003)(defendant performing walk and turn test at beginning of twenty minute observation period); State v. Korsakov, 34 S.W.3d 534 (Tenn.Crim.App.2000)(officer was doing paperwork); State v. McCaslin, 894 S.W.2d 310 (Tenn.Crim.App.1994)(defendant in back seat of patrol car) . Since breath testing devices rely on an accurate reading of alveolar or deep lung air, the introduction of stomach gases into the oral cavity, such as by a burp, or stomach contents, as through a regurgitation can produce a false high reading. Casper v. State, 70 Md.App. 576, 521 A.2d 1281 (1987). Casper is the most important case in Maryland regarding the admissibility of breath test evidence. If the State is able to show the test was completed within two hours of apprehension, the test technician and equipment are approved by the toxicologist, the burden shifts to the defendant to show "an indicia of unreliability" in order to shift the burden of proving reliability for purposes of admissibility back on the State. Is the test scientifically accurate and reliable? White v. State, 142 Md.App. 535, 790 A.2d 754 (2002)(the defendant may call a psychiatrist to testify the defendant suffered from post traumatic stress disorder, provided the proffer sufficiently relates the conduct to the condition). State v. Werkheiser, 299 Md. 529, 474 A.2d 808 (1984). In Werkheiser, the failure to obtain a blood sample as required by statute did not require a dismissal of the case. Instead the jury would be allowed to infer that a test, if conducted, would have been favorable to the defendant. State fails to prove it offered a test. Under Lowry v. State, 363 Md. 357, 768 A.2d 688 (2001), failure to offer a second test, where the first test is invalid, may generate a "Werkheiser inference." In a jury trial, the "Werkheiser inference" is not a jury instruction, but may be argued in closing by defense counsel. Preliminary Breath Test (PBT) is not admissible. See Harmon v. State, 147 Md.App. 452, 809 A.2d 696 (2002); Transp. Art., § 16-205.2. Bailey v. State, 355 Md. 287, 734 A.2d 684 (1999)(home detention may not be imposed as a condition of probation, unless expressly authorized by statute, statutory authorization for "confinement" as a condition of probation is only in Charles County, St. Mary's County, Cecil County, Harford County and Calvert County) (note - in 2001 this decision was legislatively repealed - see Criminal Procedure Article § 6-219, 220 and 225). Ethical considerations - On occasion, counsel will be required to walk an extremely fine line at sentencing. 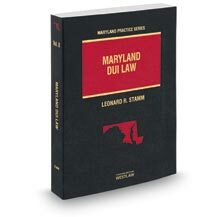 This occurs when the client has disclosed to counsel a prior conviction, usually in another jurisdiction, which does not appear on the Maryland driving record. Counsel has potentially conflicting obligations which can be reconciled. On one hand, the disclosure of the prior conviction may fall under the attorney-client privilege. On the other hand, the attorney owes the court complete candor and truthfulness. If asked by the court, counsel should assert the attorney-client privilege, defer to the client, and not make any representations that could be construed as misleading by the court. If the client makes a misrepresentation, counsel has a duty to urge the client to correct it or counsel must reveal it to the court. See Md. Code Ann., Cts. & Jud. Proc. § 9-108 (attorney-client privilege); Md. Rule 1.6; Md. Rules 3.3, 4.1 (duty of candor to the tribunal and to others); Ethics Opinion 92-39 (7/16/92); Ethics Opinion 89-17 (undated); Ethics Opinion 86-44 (undated); Florida Ethics Opinion 86-3 (12/15/86). In some situations, instead of deferring to the client, the attorney may choose to assert the Fifth Amendment on his or her behalf. Mitchell v. United States, 526 U.S. 314 (1999)(defendant may assert the Fifth Amendment at sentencing, even after a plea of guilt). As a result of the Immigration and Nationalities Act of 1996 (INA), a number of draconian provisions are in place that may result in the deportation of a non-citizen, for certain drunk driving related convictions. In all cases, the practitioner should consult with a lawyer who handles immigration cases on a regular basis. Aggravated felonies. If an alien is convicted of an offense that is considered to be an aggravated felony deportation is conclusively presumed. 8 U.S.C. § 1101(a)(43)(INA § 101(a)(43))(definition of "aggravated felony"); 8 U.S.C. § 1228 (INA § 238). The final requirement is a sentence of at least one year. This includes the suspended portion of the sentence. Under the relevant provision a sentence of one year suspended would qualify for aggravated felony treatment. 8 U.S.C. §§ 1101(a) (43)(F) (INA § 101) and 48(B). A "conviction" as defined by the INA includes probations before judgment and pleas of nolo contendere. 8 U.S.C. § 1101(a) (48)(A) (INA § 101). Crimes of moral turpitude. An alien who is convicted of two crimes of moral turpitude or one conviction of moral turpitude coupled with a conviction of an offense carrying a year or more in jail, within five years of entry, or ten years for certain permanent residents, is deportable. 8 U.S.C. § 1227 (a)(2)(A)(i) (INA § 237). Drunk driving while suspended, where the person was suspended as a result of drunk driving conduct was is a form of aggravated drunk driving in Arizona. It was also held to be a crime of moral turpitude in Matter of Lopez-Mesa, Interim Decision 3423 (BIA 1999). Fighting to Win - DWI Trial Practice Manual, Patrick J. O'Guinn, Sr.
How to Defend a Drunk Driving Case, Fifth Edition, A Guide to Practical, Procedural, and Legal Aspects, John Henry Hingson III, Clark Boardman Company, Ltd.
Medicolegal Aspects of Alcohol, Edited by James C. Garriott, Lawyers & Judges Publishing Co.
National Highway Traffic Safety Administration, DWI Detection and Standardized Field Sobriety Testing. Since material ordered from NTIS may not be returned and is nonrefundable, the order numbers listed here should be confirmed prior to ordering. The NTIS web site also has the videotapes that are used in the courses. DWI Law & Science Journal (John Tarantino, ed.). Published monthly by Whitaker Newsletters, 313 South Avenue, P.O. Box 192, Fanwood, N.J. 07023 (800-359-6049). Subscription rate: $260/year. Drinking Driving Law Letter, (Donald H. Nichols and Flem Whited, III, ed.). Published 26 times per year by West Group, 620 Opperman Drive, St. Paul, MN, 55164 (800-328-4880). Subscription rate: $362/year. Directory of Alcohol Related Forensic Experts, published by Whitaker Newsletters, 313 South Avenue, P.O. Box 192, Fanwood, N.J. 07023 (800-359-6049).